It’s that time of year again – International Open Access Week, October 19-25, 2015, is almost upon us! This will be Mason’s 7th year of celebrating Open Access Week, which began as a student-led national day of action in 2007. See below for our exciting line-up of workshops, presentations, and activities and join us at any or all of these events! Do you have scholarly items that you would like to upload to MARS but just haven’t had the time to start the process? To kick off International Open Access Week (October 19-25), Mason Publishing Group is hosting a MARS “deposit-a-thon” to help you get your scholarship into our institutional repository. On Monday, October 19, from 1:00 to 3:00 pm, we will be in the Fenwick 2nd Floor Conference Room, ready to guide you through the process of setting up an account (if you don’t have one) and uploading content to MARS. Drop by with your CV and, if possible, a laptop, to get advice on your publishers, identify which versions of your published articles you can upload, and start entering those items into MARS. Start International OA Week by releasing your scholarship beyond the paywall! We will have cookies but BYOD. Is your grant funder or publisher requiring that you openly share your data and/or research findings? Are you interested in making versions of your scholarship and data available online with no pay barrier, but are not sure how? Join us on Tuesday, October 20, for “Tips and Tricks for Sharing Your Research.” Presenters will provide an overview of the services offered by the George Mason University Libraries to support researchers in preparing and openly distributing their scholarship. Topics discussed will include: an overview of the repository services, how you can get your research (manuscripts, data, etc.) into our repository, and guidance on best practices for sharing research. There will be time for Q&A and discussion. Come pick up some free swag and ask one of our librarians about Open Access to research and open educational resources! The info tables will also feature materials about ORCID (orcid.org), a free service that provides researchers with a unique identifier to distinguish their research activities from those of others with similar names. Online access to media has revolutionized how consumers experience music, television, film, and games. Free or low cost distribution and production models allow us to expand our appreciation for new genres and create exciting new material to share. 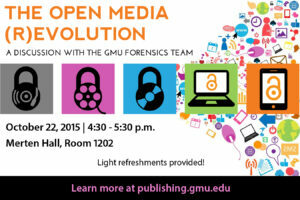 Join us on October 22 when student members of the nationally ranked GMU Forensics Team discuss how open media models have changed our role as consumers and as creators of new content. How have they sparked collaboration among established and new partnerships? What does the entertainment industry gain from making their material ‘free’? What are the barriers to this explosion in digital content? Share your opinions and questions during this free discussion! Light refreshments will be served. Featured speakers are Samuel Abney, communication major; Natalia Castro, integrative studies; AK Komanduri, government and international politics major; and Nathan Leys, government and international politics major. Online access to free learning materials has allowed educators, like you, more freedom and creativity than ever to tailor their courses. You have the freedom to reuse all types of media, to modify content to suit your pedagogy and your students’ learning styles, and to create completely new material. Furthermore, you have the opportunity to reduce textbook costs for your students! But how do you know when content on the web can be modified and reused? Can you rely on the purported quality of, for example, open textbooks? What can you do to share materials you create with a broader audience and still get credit for the time and effort you put into them? Why consider using anything but the traditional textbook you have selected for a course? You might already be using open resources in your courses. Are you making this cost-savings known to potential enrollees? The University Libraries wants to hear how your use of open resources can be supported. Please register for this workshop today and save your place! There are only 35 seats available. What tools do you use in your research workflow? Web of Science or Google Scholar? Zotero or Papers? ORCID or ResearchGate? JCR or Altmetric? George Mason University faculty and graduate students are invited to take this graphical survey—101 Innovations in Scholarly Communication—about research tool use. It takes about 10 minutes to complete and you can opt to receive a visual characterization of your workflow compared to that of your peer group via email. Why participate? You will learn how your use of digital research tools compares to that of your peers, and you may discover some new tools. You’ll inform Mason’s University Libraries about what you use so that we can optimize library services and resources to suit your needs. By taking this survey, developed by librarians at Utrecht University, you are also contributing to a global effort to chart the evolving landscape of scholarly communication. The survey will investigate how tool usage varies by discipline, country, and research role. The survey will run until February 2016. Preliminary results of this international survey, as well as the final dataset, will be posted on the 101 Innovations in Scholarly Communication site. The University Libraries will also share our community’s dataset and produce a publicly available report. The survey link above is unique to the George Mason Community. If you wish to promote the survey to scholars outside of George Mason, please direct them to https://101innovations.wordpress.com/. 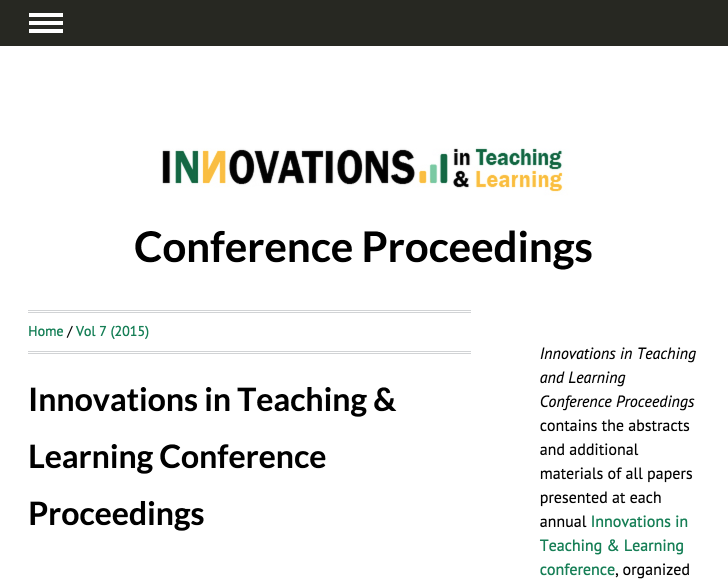 Mason Publishing Group recently partnered with the Center for Teaching and Faculty Excellence (CTFE) to publish the proceedings from this year’s Innovation in Teaching and Learning Conference. The event, which was sponsored in part by the University Libraries and Mason Publishing Group, was very successful, bringing in over 300 attendees and featuring the scholarship of many of our colleagues in the library. Built using our journal publishing platform, Open Journal Systems, the Conference Proceedings served as an online guide to the conference, providing access to session information and presentation abstracts in a mobile-friendly format. It will continue to serve as a place for presenters to share their papers and presentation materials with colleagues locally and across the broad academic community. The publication has been very successful, with 71 unique visitors to the site during the two days of the conference and pre-conference workshops, many of whom returned to the site multiple times. 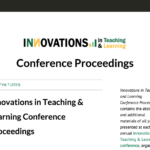 We invite you to browse the Conference Proceedings and learn more about the excellent panels and posters presented at http://journals.gmu.edu/ITLCP. Publishing conference proceedings is a priority for the Mason Publishing Group. There is an abundance of innovative research taking place and being shared on the George Mason campuses, but that research is at risk of being ephemeral without mechanisms to publish, share, and preserve. As you plan for upcoming conferences, consider publishing the proceedings with Mason Publishing. In the “Increasing Access to the Results of Federally Funded Research” policy memorandum released in February 2013, the White House’s Office of Science and Technology Policy (OSTP) Director John Holdren directed Federal agencies with more than $100 million in research and development expenditures to develop plans to make the results of federally funded research freely available to the public within one year of publication. The memorandum also required researchers to better account for and manage the digital data resulting from federally funded scientific research. The final policy reflects substantial inputs from scientists and scientific organizations, publishers, members of Congress, and other members of the public—over 65 thousand of whom recently signed a We the People petition asking for expanded public access to the results of taxpayer-funded research. Click here to see the list of agencies that have made their implementation plans public. The Scholarly Communication Program at Columbia University has also put together brief summaries of the agencies’ proposed solutions for providing public access to articles and digital data sets. 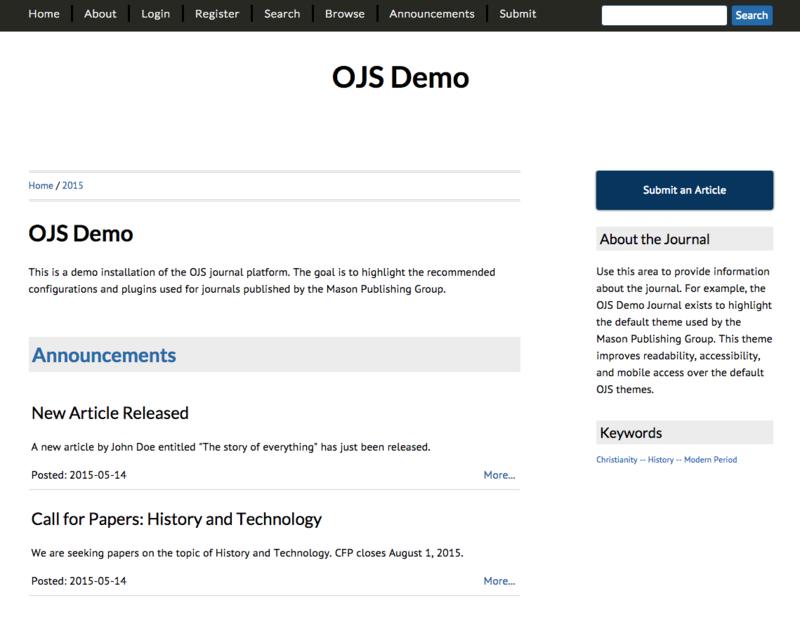 Mason Publishing is pleased to announce the release of a responsive theme for journals published on our OJS platform. Featuring larger font sizes, responsive images, and mobile-ready styles, this theme gives a modern look to journals hosted by Mason Publishing. The source code is available on Github at https://github.com/masonpublishing/OJS-Theme. Contact Jeri Wieringa at jwiering@gmu.edu to launch your own journal with Mason Publishing or for help configuring the new theme. Learn more about how you can support the adoption and development of high-quality open courses and educational resources by checking out the following resources on grants, OER advocacy, and other OER guidelines. 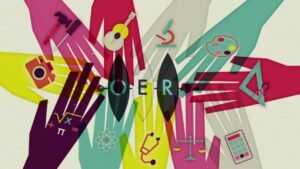 The rest of our series on Open Educational Resources (OER) features collections of open courses, textbooks, and course content that you may use, re-purpose, and distribute for your teaching and learning needs.